As a Dog Trainer for over 7 years, I have successfully trained hundreds of dogs throughout the Acadiana area, including, Baldwin, Breaux Bridge, Broussard, Cade, Carencro, Cecelia, Charenton, Crowley, Duson, Delcamber, Jeanerette, Lafayette, Loreauville, Lydia, Milton, New Iberia, Opelousas, Saint Martinville, Sunset, and Youngsville. My services are recommended by veterinary offices throughout the state.I've never met a dog I couldn't train, so I am 100% certain I can help you train yours! There is no dog behavior that is impossible to change. If someone has told you that it's too late or that your dog is not trainable, they just haven't learned how. How do I know the Bark Busters method will be successful? Worldwide, Bark Busters has successfully trained 1 million dogs - even dogs that other dog trainers have been unable to train. In home training - where your dog is the most comfortable, less stressed, most receptive and most likely to display bad behaviors. Personalized dog training - no "one size fits all" like dog training or puppy training classes. I develop a personalized one-on-one lesson plan based on your dog's particular issues and your goals. Positive dog training - no shock collars or clickers.Our Arnaudville dog training is humane and produces longer lasting results than treat training or force. Communicating with your dog - I will teach you a method of communication that your dog already understands, based on canine communication, body language, and pack leadership. You will learn how to use your body language and vocal communication to get your dog to focus on you and respond to your directions.By reinforcing our dog training techniques 10 - 15 minutes a day, you will soon become a knowledgeable and proud dog owner. Too often dog owners want to get rid of their dog for a "good dog". Dogs are not born good or bad - they all want discipline and to learn the house rules. They want to please you - they just don't know how until you are both on the same page. I will teach you to be the "leader of the pack" so your dog listens to you. This will end your frustration and his, putting you on the path to having the beloved family pet you want! 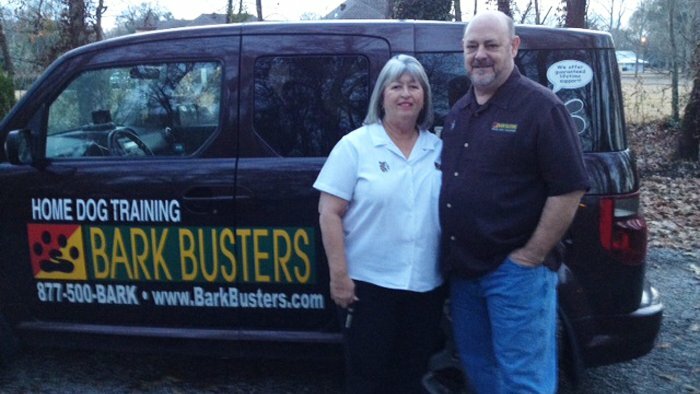 For the most effective dog training in Acadiana, call Pauline & Kurt Richard at Bark Busters Home Dog Training.